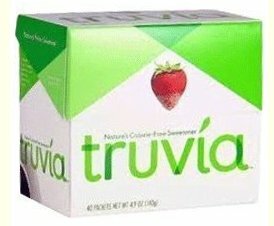 Truvia is a sweetener developed by Cargill and Coca Cola. It contains an extract of the Stevia plant and it is marketed as a natural calorie free product. Unlike it's main competitor Pure Via it does not replace sugar spoon for spoon. It is about three times as sweet as sugar, so a smaller amount is required. It contains Rebaudioside A, a Stevia extract. It also contains Erythritol, a low glycemic, zero calorie carbohydrate. This is a Sugar Alcohol and is used as a bulking agent as Stevia is too sweet to be used on it's own. It also contains natural flavorings to negate any aftertaste. Most people find the taste excellent with little aftertaste, in fact some people find it to be one of the best sweeteners available. Other people, unfortunately, find the taste completely unacceptable. There seems to be a huge variation in taste perception around this product and with Stevia in general. Comments have been made that the product is mostly Erythritol, not Stevia, and on a weight basis this is true. But this is because Rebaudioside A is 300 times as sweet as sugar, and it needs a bulking agent to measure it out. In fact 75% of the sweetness comes from Stevia, only 25% from Erythritol. Erythritol is considered to be a safe Sugar Alcohol. It does not usually cause the types of problems associated with other sugar alcohols (Xylitol, Sorbitol etc) such as cramps or bloating, though there may be some concerns in this regard. Some people, especially those with irritable bowel syndrome may find it unsuitable. It is a natural product that occurs in some fruit and mushrooms. Worryingly though, some people have been reporting adverse effects to the consumption of Truvia, though not Pure Via. This would appear to be related to either the Erythritol or to other masking flavors. Symptoms have included bloating, fatigue and a metallic taste in the mouth. It is early days yet - but watch this space. Another concern is that ingredients may be partly produced from genetically modified plants. Clarification from the producers in this regard would be helpful. Truvia is one of the better zero calorie sweeteners on the market, though not all people have given it favorable reviews. Unlike Pure Via it is a genuinely zero calorie and zero glycemic sweetener. It is totally suitable for diabetics and may also help to regulate blood sugar. It is not quite a convenient as Pure Via as one third of a spoon needs to be carefully measured out to replace one spoon of sugar. Portion size packets are available, though this is a more expensive way to purchase it. It has been very well received on the market, has been awarded some rave reviews and is already a huge seller. However there are also some reports of unpleasant side effects, likely caused by ingredients other than the Stevia.